As bed bugs become more and more common in our society, many people are increasingly concerned about bed bug infestations. 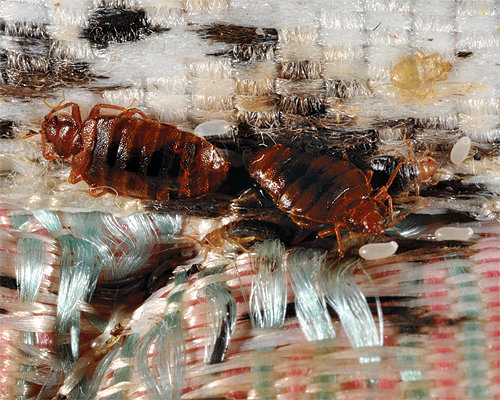 Bed bugs are very difficult to find and can be quite costly to control if not detected early. Additionally, it is difficult to determine if any bed bugs are still present following control efforts. 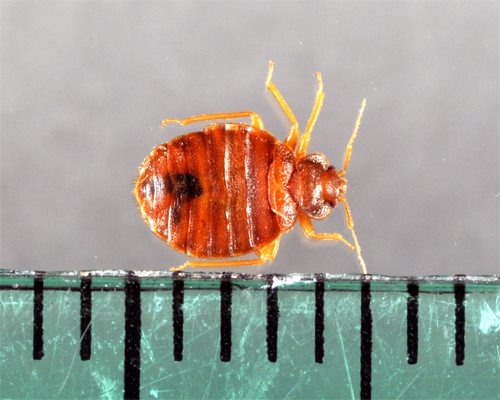 This publication describes several tools that help detect the presence of bed bugs. There are three commercial bed bug monitors available for detecting bed bugs: Climbup™ Insect Interceptor (Susan McKnight Inc, Memphis, TN), CDC3000 (Cimex Science LLC, Portland, OR), and NightWatch (BioSensory Inc., Putnam, CT). The Interceptors are the most simple and inexpensive tool available for monitoring bed bugs (see references on last page). They are placed under the legs of beds and upholstered furniture to intercept bed bugs that are dispersing from the furniture or trying to reach the furniture for a blood meal. The device does not contain any attractants. Thus, it is considered as a passive monitor. This device takes advantage of two bed bug behavioral characteristics: active searching for a human host upon which to feed and tendency to climb vertical coarse surfaces. The furniture must be pulled away from walls and any other bridges between the furniture and the floors must be eliminated. Interceptors are not intended for use in vacant rooms and cannot be used when furniture legs are absent or the furniture legs do not fit into the interceptor. Interceptors need to be placed for at least a week or longer to detect bed bugs at very low numbers. Detailed instructions can be found from the manufacturer's web site. Studies have shown that Interceptors are often much more effective than visual inspections. CDC3000 and NightWatch use carbon dioxide (CO2), heat, and a chemical lure to attract and trap bed bugs and are considered active monitors. They can be placed anywhere near the infested furniture. Each device requires a CO2 cylinder as CO2 source. The CO2 cylinder for CDC3000 lasts for about 10 hours. A new CO2 cylinder is needed for each night of operation and users need to purchase cylinders from the manufacturer. NightWatch employs much larger, refillable CO2 cylinders, which may last up to five nights depending on the cylinder size. Users can purchase CO2 cylinders and refill them from local retail stores. While there are clearly differences between these two devices, when operated according to the manufacturer's directions, both devices are equally effective. A recent study indicates that deployment of CDC3000 or NightWatch was at least as effective as a thorough visual inspection, but not as effective as seven day deployment of Climbup Insect Interceptors. Recently, researchers from Rutgers University designed a dry ice trap for monitoring bed bugs which only employs dry ice (source of CO2) to attract bed bugs. Tests in apartments indicate a dry ice trap is equally, or more effective than the abovementioned bed bug monitors. There are some inherent safety risks that are associated with dry ice, and it is always advisable to contract the services of a pest management professional that uses devices that have been designed and tested to monitor and detect bed bugs. However, the dry ice trap, when designed and used correctly, offers an effective method for individuals that cannot afford professional pest management services. The following are step-by-step instructions on how to make and use dry ice traps to monitor bed bugs. 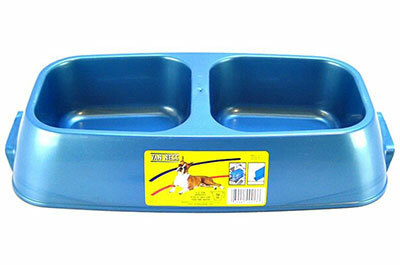 Start by buying a 64 ounce capacity double bowl cat feeder (35.5 x 17.5 x 7 cm, Figure 1), a 1/3 gallon insulated container (jug) (Figure 2), and a bottle of talc powder from a local retail store. A 64 ounce round single bowl cat feeder works equally well. Talc is available as baby powder products in retail stores. The jug is used to hold dry ice. Dry ice is the solid phase of carbon dioxide (CO2). At room temperature, dry ice changes (a process called sublimation) into CO2 gas, which attracts bed bugs. Once filled, a 1/3 gallon container (jug) can release CO2 for 10-12 hours. In an air-conditioned room, the CO2 release rate from a 1/3 jug is about the same as that from two people. Attach a piece of white cloth to the exterior surface of the cat feeder with masking tape (Figure 3). The upper edge of the fabric needs to be tightly attached to the cat feeder to prevent bed bugs from hiding under the fabric. Alternatively, you may roughen the exterior surface of the cat feeder with sand paper. The goal is to allow bed bugs to climb up the cat feeder easily. Apply a very thin layer of talc with a cotton ball to the interior surfaces of the inverted cat feeder. The powder prevents trapped bed bugs from escaping. You are now ready to use your own bed bug monitor to detect bed bugs. Use Caution when handling dry ice! Dry ice is VERY COLD (-109.3°F) and can freeze on contact causing skin injury! Dry ice releases Carbon Dioxide, which could cause asphyxia! Transport in well ventilated conditions. Do not store in a confined space, such as a closet, or walk-in freezer. If storing in a freezer, the freezer should be located in a well ventilated area. Deploy the trap in a ventilated area. Find a local dry ice vendor from the following web site: www.dryicedirectory.com. Dry ice costs around $1.00 per pound. Bring a foam cooler with you when buying dry ice. Dry ice pellets are easier to handle than large chunks of dry ice. You can temporarily store dry ice along with the foam cooler in a freezer for several days. Ten pounds of dry ice lasts for 3–4 days when stored in a freezer. 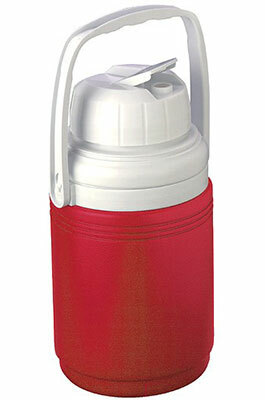 Fill up the insulated container (jug) with dry ice (a 1/3 gallon jug holds about 2.5 lb dry ice). Leave the opening of the jug slightly open and place on top of the inverted cat feeder (Figure 4). Make sure the jug does not touch the edge of the cat feeder. 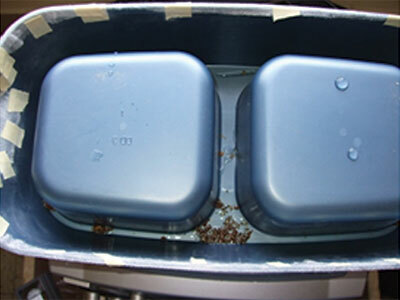 You may add a little water (barely covering the bottom of the feeder) to kill the bed bugs that are trapped. Place a warning sign or tape on the monitor to prevent children from tampering with the trap to avoid accidental injury or ingestion of dry ice. If necessary, use tape to secure the top of the jug. Now the dry ice trap is ready to attract and catch bed bugs. Place the trap beside the bed or sofa where most of the bed bugs usually hide. Set up the trap in late afternoon to maximize the catches because bed bugs are most active during the night. Leaving the room unoccupied during the trapping period is not necessary, but is helpful. Place one trap in each room if multiple rooms are suspected having bed bugs. Only one trap should be used per room. Avoid using a fan near the trap. Check both the outside and inside of the cat feeder the next day. A trap can catch a few bugs to hundreds or even more than a thousand bed bugs per night depending on infestation levels (Figure 5). Occasionally bed bugs may stay on the fabric covering the exterior surface of the cat feeder. Since young bed bug stages are very small, using a magnifier will help identify them. After examining the trap, discard the trapped bed bugs into a toilet and flush them into the drain. If no bed bugs are caught after one night, you can set up the trap again for several more days to increase the likelihood of identifying the presence of bed bugs. This is necessary because not all bed bugs are attracted to the trap in one day and bed bug eggs may be present in the room. You need to replenish the dry ice every day. Before reusing the cat feeder, make sure the talc is present. While this method is very effective at detecting bed bugs, a zero trap catch should never be viewed as a confirmation that no bugs are present. If you do not capture any bed bugs but are still being bitten or suspect having bed bugs, you should hire a skilled professional to inspect and provide recommendations. Bed bugs may lay eggs on the cat feeder. 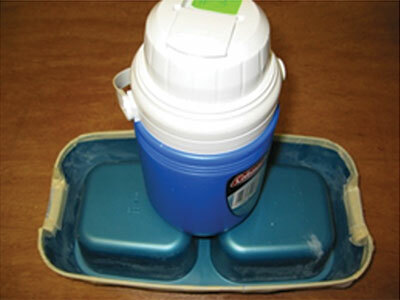 Store the used cat feeder in a freezer for several days or in a sealed plastic bag after use. Due to safety concerns associated with dry ice, it is recommended that commercial pest management providers use commercially manufactured bed bug detection devices to monitor bed bugs. People should not rely on bed bug monitors for controlling bed bugs. Monitors are only intended to detect bed bugs and monitor control efforts. 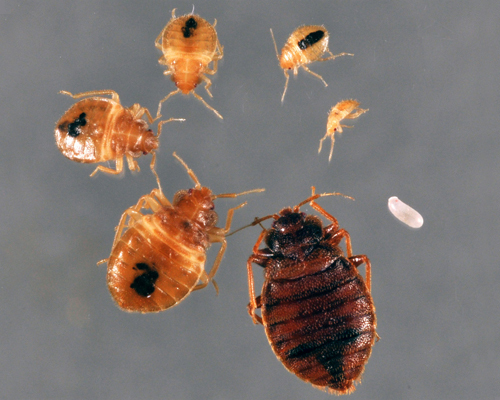 Once bed bugs are found, proper treatments should be taken to eliminate the infestation promptly. Wang, C., T. Gibb, G. W. Bennett, and S. McKnight. (2009) Bed bug attraction to pitfall traps baited with carbon dioxide, heat, and chemical lure. Journal of Economic Entomology 102: 1580-1585. Wang, C., T. J. Gibb., and G. W. Bennett. (2009) Interceptors assist in bed bug monitoring. Pest Control Technology 37(4): 112-114. The author appreciates the critical review of an earlier draft by Mr. Richard Cooper (Cooper Pest Solutions, Lawrenceville, NJ) and Dr. Stephen Kells (Department of Entomology, University of Minnesota). Mention or display of a trademark, proprietary product, or firm in text or figures does not constitute an endorsement by Rutgers Cooperative Extension and does not imply approval to the exclusion of other suitable products or firms.